Jonny Lomax faces yet another psychological barrier as he licks himself into shape for the start of the new First Utility Super League campaign. The Saints’ full-back will line-up against the Catalans Dragons at Langtree Park in the club’s opening fixture of the new season on Friday night wary of fact that the last time he locked horns with the French outfit he suffered serious knee ligament damage and missed the last 14 fixtures of 2014 season, including the 14-6 Grand Final victory over arch-rivals Wigan Warriors. Since then, however, Lomax has undergone intensive rehabilitation and also tested his knee in the build-up to the new campaign, which included high-profile friendlies against both Widnes Vikings and Wigan Warriors and, thankfully, came through virtually unscathed. 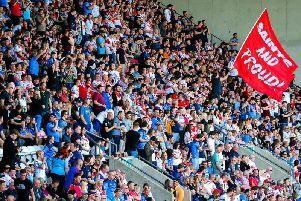 Now he has firmly set his sights on helping Saints retain the Super League title after featuring in the sides which suffered Old Trafford heartbreak against Wigan Warriors in 2010 and Leeds Rhinos the following year. Despite having to sit out last year’s Old Trafford Grand Final, Lomax was able to view the spectacle from a different perspective. The result - and the team post-match celebrations - also helped to lift Lomax’s spirits as he battled to overcome his season-ending injury. They were dark days,’’ he admitted. ‘’As a sportsman you don’t want to be told you have suffered cruciate ligament damage. It’s the one you dread most and in my case the second I’d suffered but the previous one was on the other leg. But at this stage the 24-year-old is looking no further ahead than club rugby and not adding international honours to his CV.